Summer is just around the corner and this means only one thing, more ice creams, smoothies, and juices. Juices and milk shakes have always been summer favorites for most of us. These drinks hydrate and cleanse the body of toxins, thereby contributing to glowing skin, shiny hair, and slim, fit and healthy physique. Carrot Beetroot Blend: Grate raw carrots and beetroot and blend them until smooth. Add ice cubes (as required), ginger paste, and a dash of salt. This blend is rich in vitamin A and B12, and is loaded with macro and micronutrients. Banana Smoothie: Banana is a popular detox fruit. Add skimmed milk, banana, and ½ teaspoon of honey. Blend till the texture becomes smooth. You may add some walnuts if needed. This smoothie is rich in calories, protein, iron, calcium, and vitamin B6. Spinach Apple Blend: This is one of the most popular juice blends since green juice is the new health craze. Blend these ingredients and add salt, pepper, and some mint before serving. This drink is rich in fiber, protein, iron, calcium, and vitamin A. Tip: A few drops of lemon juice also adds to the taste. You may mail us your summer shake recipe. This is not a meal replacement. 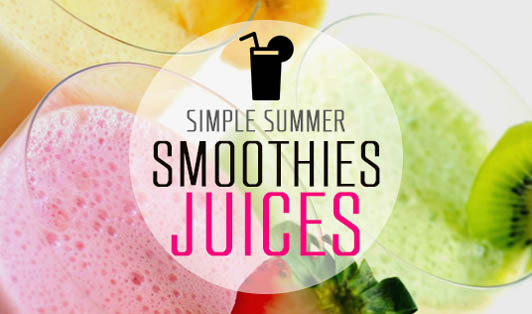 These smoothies can be consumed in the evening or in between meals.